The poor little kangaroos are bored! They saw a lot of little rabbits jumping, and decided to try to catch them and make new friends... Rabbits have other ideas; there are too many carrots to eat, so they really prefer not to get caught! 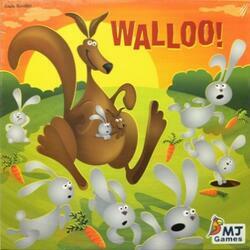 The players each take care of a group of rabbits, trying to keep them away from the kangaroos. To succeed, they will need their intelligence, and that may only be a bit of luck.